The SeaOrbiter will allow researchers to swim into parts of the deep ocean, where no one has gone before. If you want to do deep sea ocean research today, you’ll have to take a journey to the Florida Keys, where the world’s last remaining underwater research lab, the Aquarius, is housed. But that’s soon about to change. When it’s completed, the SeaOrbiter, a spaceship-like underwater vessel, will become the first ocean lab where researchers can live 24/7 over long periods of time. (The Aquarius, in comparison, goes on missions for 10 days on average). It’s the Starship Enterprise of the sea, exploring parts of the ocean where no man has gone before. The $43 million SeaOrbiter project is the result of a 30 year research and design process. 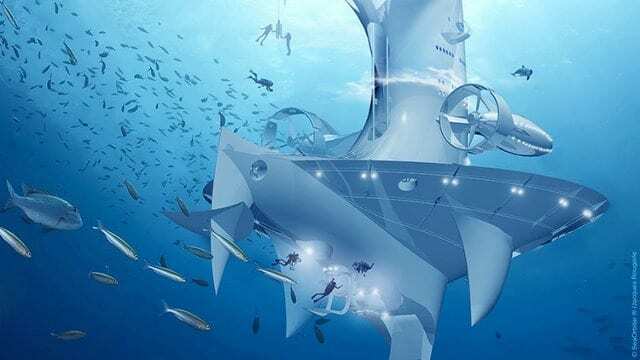 Created by sea architect Jacques Rougerie and guided by experts like Jean-Michel Cousteau and former NASA chief Daniel Goldin, the vessel will hold a crew of up to 22 people when it launches. Its first trip will be to Monaco, where Rougerie hopes that researchers will gather new details about the vast underwater areas surrounding the country. December 8, 2015 - SeaOrbiter: An Aquatic Version of the Space Station Seeks Funding Now - HowStuffWorksSeaOrbiter could be a space station in the oceans, if it can raise the funds it needs for completion. Learn more in this HowStuffWorks Now article. June 26, 2012 - SeaOrbiter construction to begin | Earth EarthSkyThe SeaOrbiter concept recently completed its industrial design phase. It is an ocean-going research ship - which is part submarine. Learn more on EarthSky. November 14, 2013 - SeaOrbiter Construction Slated for 2014 ENGINEERING.comA long-term oceanic exploration vessel is set to begin construction after decades of development. March 16, 2015 - jacques rougerie's scientific & educative underwater seaorbiter vessel Designboomjacques rougerie has visioned the 'seaorbiter', a half submerged, half visible vessel that is dedicated to developing our knowledge of the ocean. January 31, 2014 - The SeaOrbiter Futuristic Marine Research Vessel Just Reached its CrowdFunding Goal, Set to Begin Construction InhabitatThe futuristic SeaOrbiter ocanic marine vessel has successfully completed its crowdfunding campaign. February 21, 2014 - SeaOrbiter set for construction euronewsThe SeaOrbiter project which is headed by pioneering architect Jacques Rougerie stepped closer to reality after a crowd-funding initiative easily.